Previous postThe godless résumé gamble Next postWho wants a PZ pin-up photo? Awww…we think of our aquarium as the kitten entertainment system. She will occasionally do that with the computer, too. All cats think in portals. Welcome to the ranks of cat slaves, Jen. You’re going to need a laser pointer. And a box of ants. Just set one ant loose, and she’ll follow it around for hours. I second the laser pointer! The Cat Who Walks Through Walls? She’s adorable and Pixel is a good name for a geeky kitty. I know another one here in Sweden. A Russian Blue. He even has his own FB and Twitter accounts. And a web page of course. Cats are awesome. Says a lot about how awesome this community is that there’s at least three people with cats named pixel here. 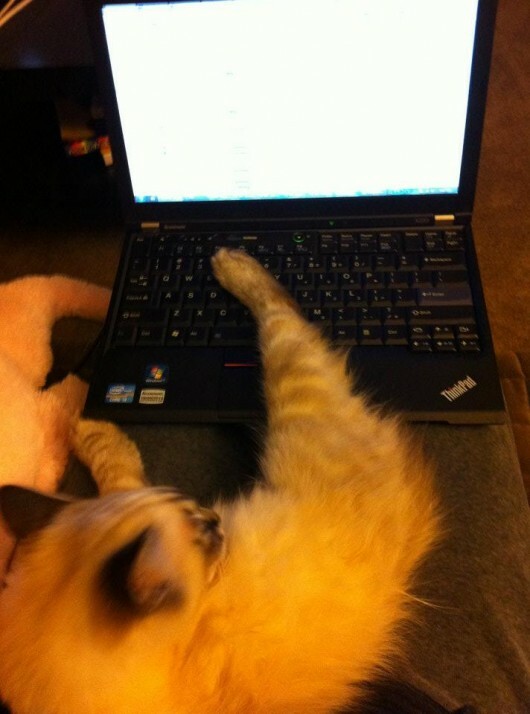 ^^ (mine is called pixel too & he looks a lot like jens – except he’s seal point, not seal lynx point). 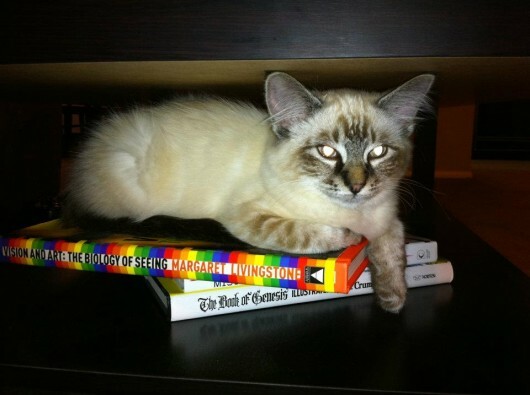 My sister, who lives in San Rafael, California, has a cat named Pixel. She also has dogs named Luna and Bella. Since my brother also has a dog named Bella, I call the youngest (who’s dubious about my awesomeness) Tinker-Bella. Just in case people thought astrology was harmless. You have to post it and take part in this contest. They figure if you are so bored you are staring at a bunch of colors that you might as well pet them. In my guild on WoW we often get the COK (cat on keyboard) warning from ecch other. Pixel is a good start for a geeky pet name, but really you’re not trying hard enough… a friend (well, vague online acquaintance) of mine has/had three cats – named Proxy, SCSI and GZip. My tortoise shell cats Yuusha and Rio both take great pride in “helping” me program when I work from home. And by help I mean roll on the keyboard or shift around in my lap until they pin one of my arms. And I agree with earlier comments on laser pointers. Get one. Yuusha has actually figured out the trick behind it and will lead people to where the pointer was last put down, immediately looking around the floor for the dot to chase when the pointer is in hand. You know there’s a comic strip called PC and Pixel (I think Pixel is the cat)? Aww, cats are great. Glad to see you are enjoying yours. 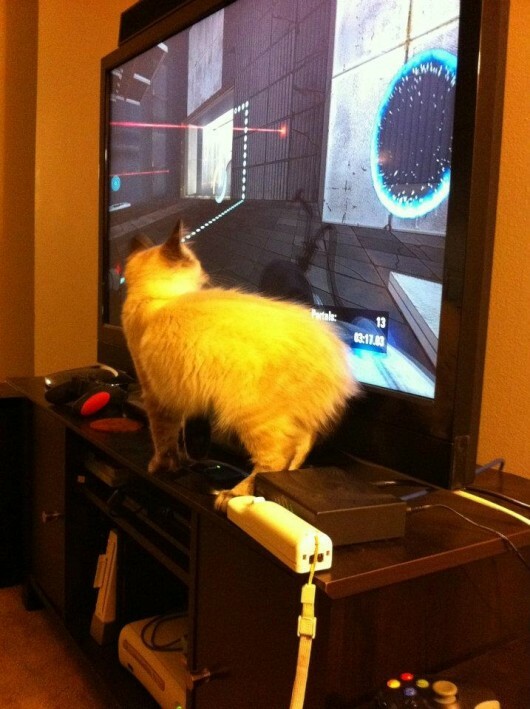 That’s also why I have my tv screen mounted on the wall above where the cat can get in the way of me and Arkham Asylum. Have to be careful with that one. Awwww! As if we didn’t have enough reason to come here. Hey, I think she wants some melk!